IN A glass-topped cabinet sit more than two dozen gleaming gold statues. The eight Oscars are instantly recognisable. There are Golden Globes and Grammys too, but it's another award that catches Gareth Jacobs' eye. It's a silver medallion, nickle-plated brass to be precise, mounted in a swivel - the Tony Award. It's the accolade he hopes to earn himself one day. For now, he's happy to feel its weight in his hands as its owner, composer Alan Menken, gingerly removes it from its display. 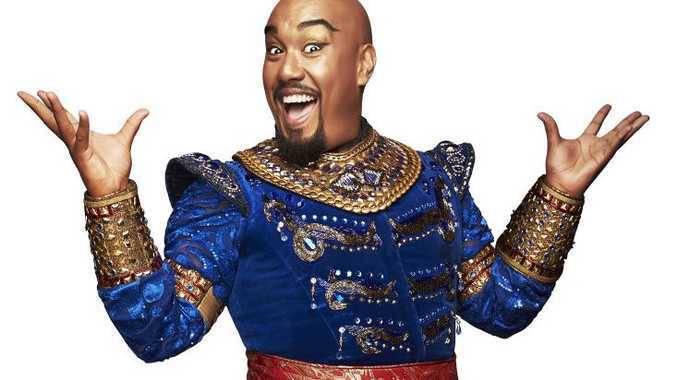 Jacobs has spent the past 18 months singing some of Menken's most beloved songs in the Australian production of Aladdin the Musical, and just before Christmas he took over the coveted lead role of the Genie from departing American Michael James Scott. Being invited into the inner sanctum of the show's musical master - Menken is known for penning the catchy tunes for some of Disney's most popular animated films including Aladdin, The Little Mermaid, Beauty and the Beast, Pocahontas and Hercules - is an honour and Jacobs isn't afraid to admit he's "geeking out". 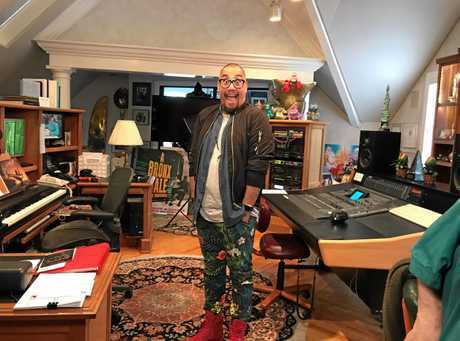 Movie posters, original artwork, memorabilia and platinum records line the walls of Menken's home studio in North Salem, about an hour's drive outside New York City where Aladdin has been playing to packed audiences on Broadway for nearly four years. "It's one of those things where you go, 'that would be cool to go and do that', but being there it was so surreal," Jacobs says. "Knowing his back catalogue and seeing all of his accolades and the posters of the shows he's done, it is my childhood." A round room with baby grand piano is connected by a hallway to the studio proper, which houses a soundboard, TV and computer screens and a keyboard. Despite all of the impressive awards, pictures from film sets (including the upcoming live action remake of Aladdin starring Will Smith) and fan letters, the studio doesn't say "look at me". It has a warm, homely feeling where a stuffed animal version of Sebastian from The Little Mermaid sits with as much pride as an Academy Award. Menken is one of only 18 people to achieve the coveted EGOT - the Emmy, Grammy, Oscar and Tony awards - also known as the "grand slam" in show business. It isn't long before he is tinkling away at the piano keys, and Jacobs joins in a singalong which jumps from Friend Like Me to Part of Your World to Be Our Guest. Menken praises our new Aussie Genie, saying he has an incredible charisma and energy and a "voice that goes to the stratosphere". Sing along with Alan Menken: Gareth Jacobs, the star of the Australian production of Aladdin The Musical, meets composer Alan Menken in his home studio in North Salem, New York. "He is so humble and lovely. He's just a regular person, which is just even better," Jacobs says. "If someone had told me that this would be part of my daily life, I would be like, 'Yeah you need to come back to reality'." We spend nearly an hour with Menken before he has to move on to other work. He's busily preparing for a trip to Japan as part of a concert tour and needs to rehearse for the two-hour show. Menken visited Australia for the first time in 2016 for Aladdin, as well as to promote his work on Disney's blockbuster live-action remake of Beauty and the Beast, and says he is keen to return to our shores - although he's not sure when his schedule will allow. "There's a lightness to being there that feels liberating and fresh," he says. "I can see why people like to go to Australia, like how people go to Los Angeles for a new chapter of their life." Growing up in the picturesque surrounds of Victoria's Mornington Peninsula, Jacobs was always a musical child. "You couldn't keep me quiet at home," he says. "We'd have friends and family over and the kids would all get together and we'd try to perform. The one we mostly performed was Grease because there was a guy and a girl." He was hooked on live theatre from the age of nine when his mother took him to see Phantom of the Opera, which he admits is "quite a heavy one" for a kid. Fittingly, Aladdin is the first Disney film he remembers watching a kid. "For me Disney started with Aladdin because of how old I was; it was the magic of it all," he says. "I remember standing on a rug in the middle of a room just hoping it would fly away and I'd be on it. "I can remember seeing it at an age where I understood everything, and I'm now living that same dream with the eight-year-old kid inside me." The first time he took over the role from Scott at the end of last year in Melbourne was an emotional milestone for Jacobs, 35, who has had a bumpy road to the top of the playbill, including everything from entertaining passengers on cruise ships in the Caribbean to a brief stint on The X Factor. "I got really emotional at the end of the show. I turned upstage and looked at the cast and that's when it hit me. It wasn't when the curtain opened; it wasn't halfway through the show; it was that last line I delivered and turned up to look at everyone and thought, 'This is real. This is me now'," he says. A big week in Agrabah is ahead as we pass on the lamp from Michael James Scott to Gareth Jacobs! "Being able to perform in my home city first was even more special because it was such a perfect circle to (arrive at) what I wanted to do and where I wanted to be with my career - that dream coming true. The journey it's taken me to get here has been a tough one. There were times where I was thinking I would give it away completely and move on with life and say, 'Yeah that was a great part of my life but now it's time to leave Neverland and grow up a little'. "There is a very niche category I fit into in music theatre and those (big) roles don't come along very often. Having something like this happen just put that really lovely bow onto the top of that present of going, 'This is where I am supposed to be in life'. "It just solidified I'm in the right place at the right time." Playing the larger-than-life Genie eight times a week is a dream come true, but it's also a demanding job. Jacobs describes the role as being "shot out of a canon" every time the curtain rises. "It is a sprint from start to finish," he says. "If you're not ready to do it then it's an uphill battle. But the way the character is written, you can never have a bad day doing it. It brings the joy to you that you may not have in your day." Friend Like Me is where the Genie really shines. It's a monster of a number, lasting for more than seven minutes as the just-released Genie introduces himself to Aladdin the street urchin. It's a fateful first meeting that will set both of their lives on exciting new courses. "Friend Like Me is the most amazing number and I'm not just saying that because it's my number," Jacobs says. "They've thrown everything and the kitchen sink in there. The pyrotechnics, the costumes, the sets, the music - you think that it couldn't go somewhere and then it does go somewhere. It takes you on this full tangent tour of the inner workings of the Genie's mind. "It's borderline over-the-top but it's fun. It's that one character that an actor dreams of in their lifetime." This is the Cab Calloway-inspired Genie as the film's creators originally envisaged him before Robin Williams put his signature stamp on the animated character. Menken believes it is a unique stage role requiring both a commanding physical presence and a lightness of foot. "The Genie is larger than life in all areas, but he needs a compassion underneath that," he says. "There's a lot of mental and physical dexterity because it's very fast - with the Genie it just comes pouring out of him. The Genie is a big character physically but he's got to have incredible agility. When we had auditions (for Broadway) these huge men would walk into the room and do cartwheels - it was like 'wow'." Aladdin the Musical also resurrects several of Menken's songs (co-written with the late Howard Ashman) which were cut from the film, including Proud of Your Boy and High Adventure, and four new songs written by Menken and Chad Beguelin. The animated film's animal characters are also reimagined for the stage show. Jafar's talking parrot Iago becomes a grovelling sidekick, Jasmine's pet tiger is replaced by three handmaids and Aladdin's trusty monkey Abu makes way for partners in crime Babkak, Omar and Kassim. But aside from those relatively minor changes, it is the familiar tale of romance and adventure you remember. "Expect the same magic and the same beautiful love story that happens with Aladdin and Jasmine and the fantasy of Agrabah," Jacobs says. "It just makes you fall in love with the show and movie all over again. They've put in more magic into the stage show and, after seeing it live, you will walk away going, 'How did they do that?' It's like a giant magic show." The real magic for Jacobs is the effect the show has on theatre-goers, particularly the children and teens contemplating a career in the arts themselves. "To be a part of someone's escapism for a couple of hours a day is what makes it so special for me," he says. "You can be having the worst day of your life and you come see a show and you get to forget it for a while and immerse yourself in this weird and fantastical and funny world. "To be a part of helping someone get lost in that world and to hold their troubles for them at the door is so special for me." Jacobs is also looking forward to taking up residency in the Sunshine State for Aladdin's Brisbane season, which will be his QPAC debut. "It will be great to come there and show you what I've got and also get Brisbane to show me what it's got to offer," he says. "It's a little trade off - I'll give you a show you won't forget and you give me a city I won't forget." Previews of Aladdin the Musical begin on Tuesday and the show plays QPAC's Lyric Theatre until June 3. The writer was a guest of Disney Theatrical in New York.